I believe that each person has their own spiritual journey. Not all of us were born into “Islam”. I didn’t even know what the Quran was until 2006. Still I believe my personal journey guided by Allah led me to circumstances which led me to finding out about the Quran. Then people tried to obscure my understanding of the Quran by telling me about the Hadith collections and making things complicated, and diverting me from the Quran. Then part of my personal journey led me to finding out that the Quran explains the Quran, not Hadith explains the Quran. This idea was suggested to me by a website. It gave me the Quran references so I knew where to look, then I checked the Quran references and found it out to be true. At this point… Was I using the Quran by itself or Quran plus website or Quran plus translation? I think I was using Quran plus website plus translation. Suppose I said, as a new convert: “Even though I have no idea how to read, speak or understand a word of Arabic, I am only going to look at the original Arabic Quran and keep staring at the words until they make sense to me”. Allah is able to do anything. I do believe in miracles. When I was a new convert, I didn’t try to read the Quran in Arabic though. Maybe upon reflection my own faith was flawed from the outset by not doing so? The natural thing to do for me was reach for an English translation of course. 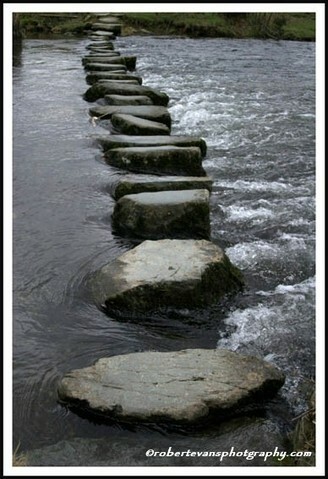 I do believe that God did give us stepping stones on our journey of spiritual enlightenment. Tools to facilitate. All good is from God. His blessings are too numerous to count. He does not wish hardship for us. I could be sick and wait for a miracle recovery, refusing all medical treatment, when the blessing is right there: a hospital with trained, qualified doctors that can give you the medicine you need. It is not the doctor you worship, or the medicine. It is God for providing the blessing. Where will I find the next stepping stone on my journey of spiritual enlightenment? Only God truly knows.